What’s Wrong With The Standard American Diet? What Does A Traditional Foods Diet Look Like? This homemade taco seasoning is a cinch to prepare. We use this blend for tacos, fajitas, burritos, and even to flavor beans. It is far faster than running to the store for one of those little packets and if you’ve read my post about the harmful spices in your cabinet, you are probably ready to start making your own spice blends anyway. Directions: Mix all ingredients well. Store in an airtight container in a cool, dark place. A simple, easy to make taco seasoning that is free of pesticides, irradiated spices and gmo ingredients. Mix ingredients well and store in an airtight container in a cool, dark place. An additive-free homemade taco seasoning that is quick and easy to prepare. Mix ingredients well. Store in an airtight container in a cool, dark place. 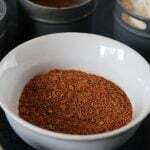 Do you have a favorite homemade taco seasoning blend? What is in it? Previous Post Do You Have Harmful Spices in Your Cupboard? Chelsea has a Masters in Education and is currently studying to become a Nutritional Therapy Practitioner (NTP). Reclaiming Vitality is a combination of her passion for good food, nutrition, and for keeping her family and herself in optimal health. If you are interested in her story, read more here. Get my ebook FREE when you subscribe to our monthly newsletter!